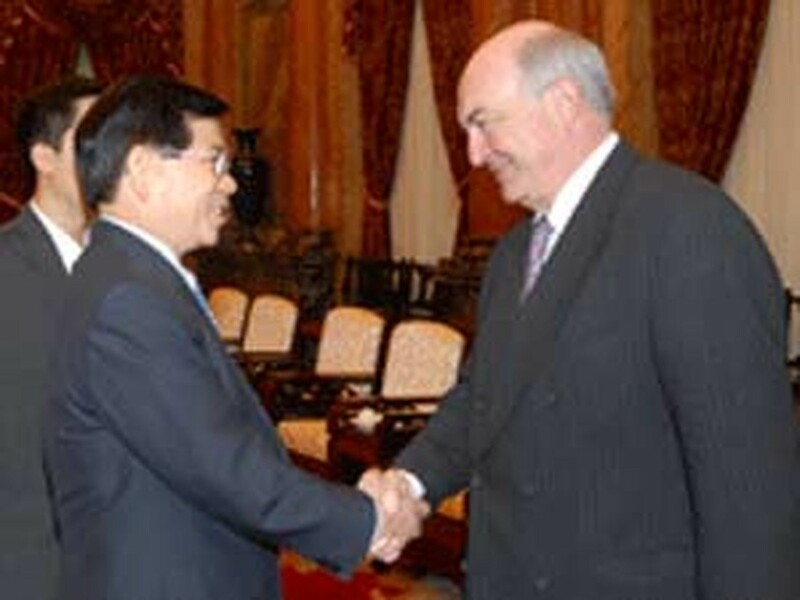 President Nguyen Minh Triet (L) shakes hand with UNDP Administrator Kemal Dervis. President Nguyen Minh Triet yesterday highly praised the UN’s assistance to Viet Nam at a meeting in Ha Noi with Mr. Kemal Dervis, the UNDP Administrator and Chair of the UN Development Group (UNDG). Mr. Triet expressed his gratitude for the UN's help with Viet Nam's national construction and socio-economic development over the past 30 years. He said that Viet Nam always supported and cooperated with the UN in socio-economic terms and in international relations, and welcomed reforms in the UN in general and the UN system in Viet Nam in particular. Mr. Dervis said that Viet Nam would be one of the first seven countries in the world to carry out the UN reform plan at the national level. In the future, he and other UN experts would share with Viet Nam more experiences in formulating socio-economic development strategies that focus on reducing poverty and improving its people's lives, he said. The two parties exchanged their views on Viet Nam’s opportunities and challenges now that it was a member of the WTO, and the areas where the UNDP and other UN agencies could help so that Viet Nam might attain the socio-economic development millennium goals set for it by the UN. Mr. Dervis also expressed a hope that Viet Nam would become a non-permanent member of the UN Security Council and continue making contributions to the UN.